Bering Men 14440-227 Solar Blue Dial Black SS Watch Stainless Steel Mesh Band The Bering Men 14440-227 Solar Blue Dial Black SS Watch Stainless Steel Mesh Band contains Quartz movement mechanics. Quartz movement watches are battery powered and considered one of the most accurate movements, requiring minimal maintenance. The Bering Men 14440-227 Solar Blue Dial Black SS Watch Stainless Steel Mesh Band is protected by very scratch resistant Sapphire crystal. Sapphire crystal is heat treated to strengthen it making it scratch and shatter resistant. The Analog dial is Blue with no subdials. The hands are Stick style and markers are located on Stick with Arabic numerals at 3, 6, 9, 12. 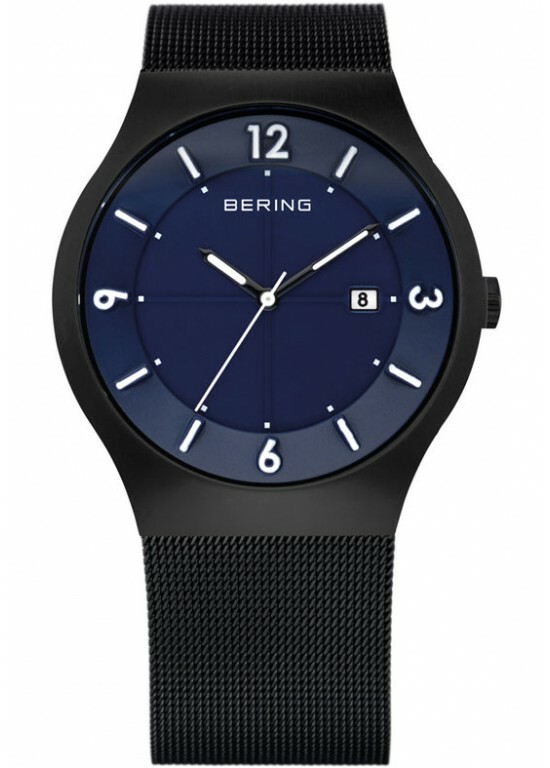 The Bering Men 14440-227 Solar Blue Dial Black SS Watch Stainless Steel Mesh Band is encased in a Round Black SS case. The Case is 40 mm in diameter and 9 mm thick. The Black Stainless Steel Mesh band is 22 mm wide and secured with a Fold Over Sliding clasp. It is water resistant up to 50 meters. The Bering Men 14440-227 Solar Blue Dial Black SS Watch Stainless Steel Mesh Band is backed by Bering Watches Three (3) Year Manufacturer Warranty. The Bering Watches we provide are the latest and newest styles. The latest models are only available to trusted and authorized dealers of Bering Watches. Each watch is brand new and hand inspected by both Bering and our team to ensure it is in perfect and mint condition. All watches are stocked here in the USA. Each watch is 100% authentic and backed by Bering Watches Three (3) Year Manufacturer Warranty.